Business Chats must be initiated on an iPhone or iPad, but they can be continued on any other iPhone, iPad, Mac, or Apple Watch signed into the same Apple ID. 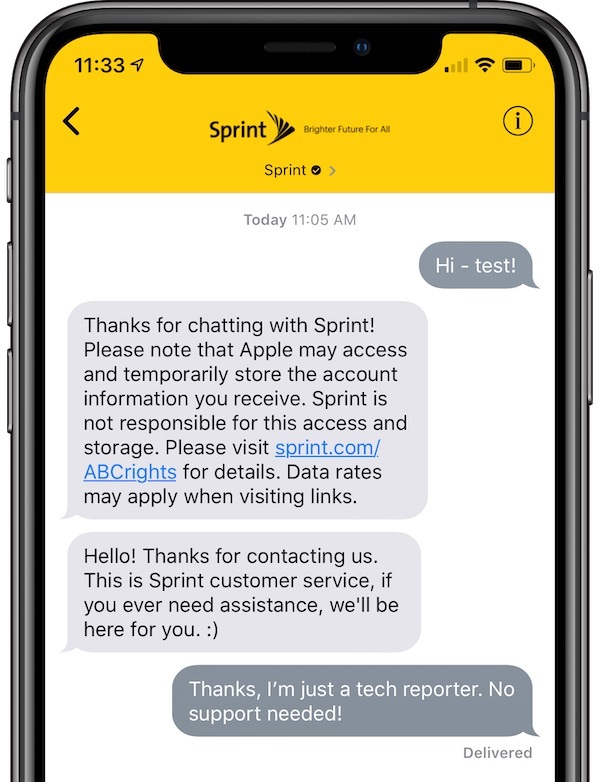 To use the feature with Sprint, visit the "Contact Us" page on Sprint.com, or search for a Sprint store using Siri, Safari, or Apple Maps, and tap the Messages icon. Apple Business Chat is now available in Australia, Canada, France, Germany, Hong Kong, Italy, Singapore, Japan, Switzerland, the United Kingdom, and the United States. The service has been adopted by over 30 companies, such as The Home Depot, Lowe's, Hilton, Wells Fargo, DISH Network, and Burberry. Was skeptical about this but had a very good customer experience using business chat with Home Depot. Optimistic if these replace those horrible call trees! Is there a list somewhere of businesses that participate in Business Chat?